State has nearly as many Samoans, but national share is lower. 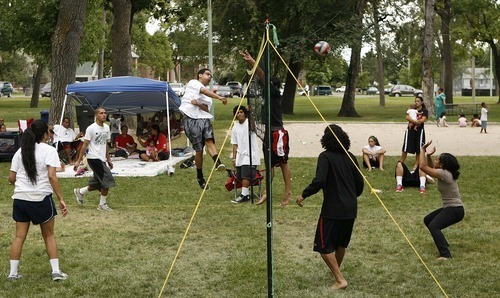 Trent Nelson | The Salt Lake Tribune A volleyball tournament took place Saturday at the Friendly Island Festival held at the Jordan Peace Park in Salt Lake City. 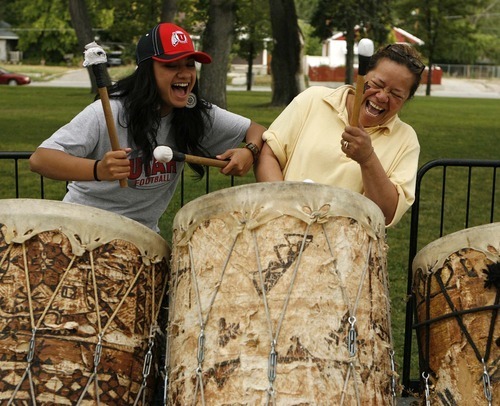 Trent Nelson | The Salt Lake Tribune Leta Fauolo, left, and Fahina Pasi share a laugh Saturday while playing drums at the Friendly Island Festival held at the Jordan Peace Park. Trent Nelson | The Salt Lake Tribune Meleana Fa performs a traditional dance, Tauolunga, on Saturday at the Friendly Island Festival held at the Jordan Peace Park. Trent Nelson | The Salt Lake Tribune Sepuloni and Siale Pulu performing a Tongan warrior dance Saturday at the Friendly Island Festival at the Jordan Peace Park in Salt Lake City. 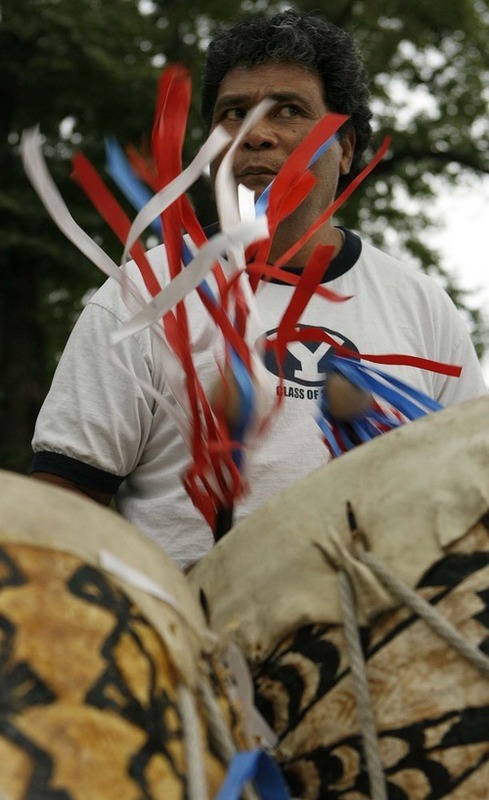 Trent Nelson | The Salt Lake Tribune Sifa Kolo leads a drumming competition Saturday at the Friendly Island Festival held at the Jordan Peace Park. Unlike Tonga, Utah has no tropical rain forests, pristine coral reefs or magnificent ocean beaches. But Utah does have a lot of Tongans. In fact, one of every four Tongans living in the United States resides in Utah, according to a Salt Lake Tribune analysis of 2010 U.S. census data. Utah ranks second among the states for total population of Tongans, behind only California  but ahead of even Hawaii. Utah's Tongan population is an eighth as large as the population of the Kingdom of Tonga, meaning it's as if one of every nine Tongans left home to live here. Salt Lake City itself even has more Tongans than all but the three largest cities on those islands. "We like it here," said Fahini Tavake-Pasi, executive director of the National Tongan-American Society, which has its headquarters, naturally, in Utah. She says the first Tongan immigrants to Utah were Mormon converts who came to live among fellow Mormons, but later brought family and friends of all religions to take advantage of educational and economic opportunities. And she says Tongans who migrated first to other states such as California and Hawaii found that Utah is cheaper and has a lifestyle pace that they like better. 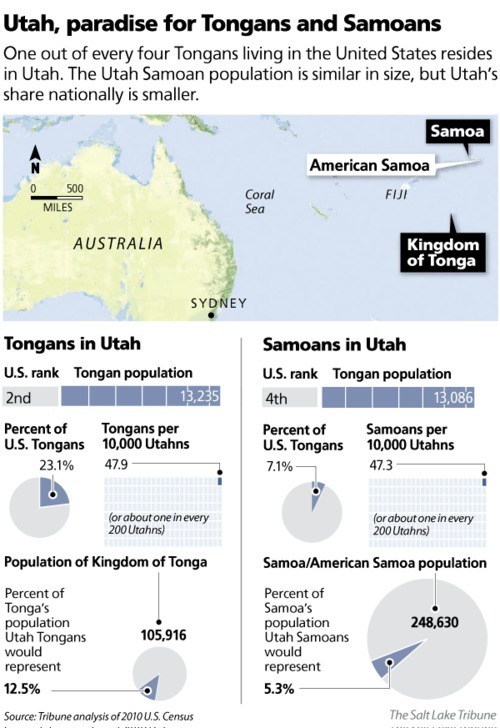 Utah also has nearly as many Samoans as Tongans  13,086 compared with 13,235. But only one of every 14 Samoans in America lives in Utah. And Utah ranks fourth among the states for its population of Samoans. But Utah's Tongan and Samoan populations are both large enough to form a critical mass that attracts more and more immigrants among friends and family from the islands, and it keeps Utah in the eye of leaders from back home. Immigration reasons • So why are so many Tongans coming to Utah? "First and foremost, they came because of religion and the LDS faith. They wanted to come to Zion," says Tevita E. Kinikini. He is president of the all-Tongan Salt Lake Utah Stake of the LDS Church, one of three such stakes in Utah. They have 30 wards and branches. Utah has 14 Samoan wards and branches scattered among regular English-speaking stakes. Tavake-Pasi adds that little immigration to Utah from Tonga occurred until the 1950s, when a few Tongans came to attend college  and several were able to stay. U.S. immigration policy that had favored European migrants changed in the mid-1960s, which made it easier for Tongans here to sponsor family members. That led to creation of a small Tongan community in the 1960s. By 1990, Utah had 3,904 Tongans. That more than doubled to 8,665 in 2000. 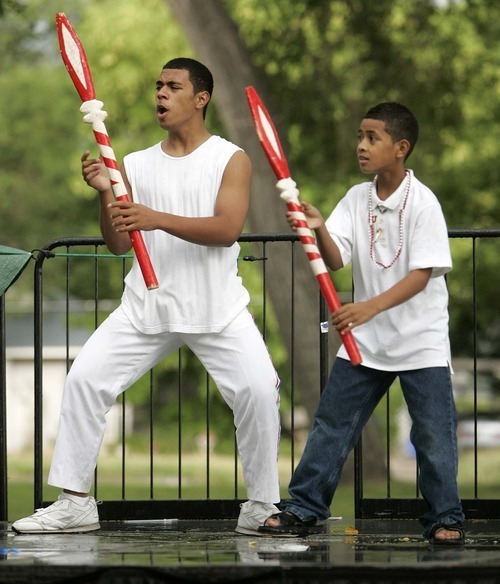 In the past decade, Utah's Tongan population grew by 52 percent to 13,235. One man's path • Kinikini's path to Utah was typical. He was born in Tonga in 1960. A few years later, his father won a scholarship to attend Utah State University. "But he only made it as far as Hawaii, where he worked in construction," and managed to send for his family when Kinikini was about 5 years old, he said. Kinikini said other members of his extended family helped build the LDS Church's Polynesian Cultural Center and portions of BYU-Hawaii. Many later left for California, and a few moved to Utah. After a time, his father's family was the only one left in Hawaii. "We found out that it was a lot cheaper to live in Utah, and we wanted to be closer to some family," he said  so his family moved here when he was 16. Samoan stories similar • Francis Te'o, bishop of the Volta LDS Ward for Samoans in West Valley City, says Samoans immigrated to Utah for many of the same reasons and in similar ways. His father came to America to attend college, then brought his family to California when Te'o was 9 years old. His father helped operate a federation to help Samoans with immigration and education. Te'o says he and his wife came to Utah first "for a family reunion. We found it was affordable here. … It was different here, where you didn't have to lock up everything and put bars in your windows," and the pace of life was slower. So they decided to move. He says he believes most who come now do so "because the education is good, and it is a good place to raise a family." Utah's Samoan population has increased steadily  and a bit faster than even Tongans  from 1,570 in 1990 to 6,470 in 2000 to 13,086 in 2010. Utah known to islanders • Tavake-Pasi said Utah's large Pacific Islander population makes it well-known in the islands, and to its leaders there. "Eighty percent of the economy of Tonga is driven by money that is sent back from families and friends that live abroad," she said. "And 60 percent of that is from the United States. It would be interesting to see how much is sent back from Utah." She said Utah is still seen there as an attractive place to move to because "the economy is tough in Tonga, too. There is not very much work available. … So a lot of them move to industrial countries," and seek places where Tongans are already established, such as Utah. Many coming from the islands first go to California or Hawaii, but often end up in Utah. "I am one who moved from California. The pace is slower here. It's a better place to raise a family," she said. And she adds the Tongans moving are not just Mormons, and that her group works with 20 denominations. With all the Tongans in Utah, Queen Mother Halaevalu Mata'aho of Tonga recently visited to rededicate the Tongan United Methodist Church in West Valley City. She and her late husband, King Aufa'ahau Tupou IV, attended the original dedication in 2004. Samoans in Utah also get some attention from home. For example, Eni F.H. Faleomaevega, American Samoa's nonvoting delegate in Congress, sometimes campaigns here. He has explained that people from that territory are U.S. nationals, not citizens, and can only vote by absentee ballot back in the islands. So Utah Samoans are a key part of his constituency. New home struggles, benefits • Tavake-Pasi said although most islanders enjoy Utah, they face challenges here. She said most Tongans are in the lower-to-middle-class economic bracket. She said they have the highest obesity rate in the state, the highest infant mortality rate and the highest risk for diabetes. Kinikini said Tongans also sometimes struggle between their old culture and Western culture, and to keep their youths out of gangs. But, Tavake-Pasi said, "it seems like most like it here. There are more opportunities here. There is good educational opportunities. Things are more affordable. There is family. It's nice."